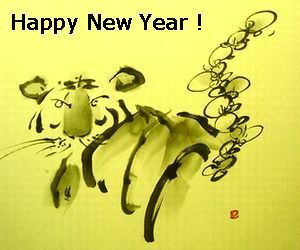 The word for ‘kiiku’, chrysanthemum in Japan, was used for the name(both boys and girls ) until seventy or eighty year’s ago(the grand father age). There is a Kitano’s film called ‘KIKU-jiro no Natsu’, the summer of KIKU-jiro. 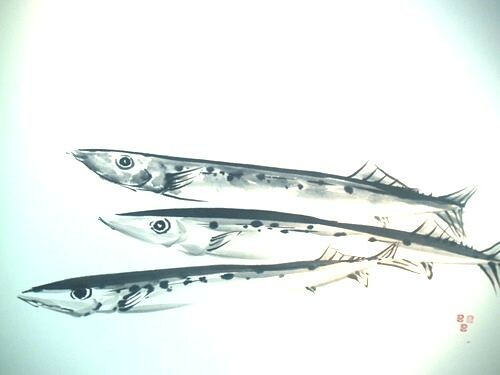 Jiro is often used for the second sun’s name. So, what I want to say here, the chrysanthemum is not pop or cute flower which you might not choose ones for the girlfriend’s birthday gift. The line won’t show up until the ink becomes dry. Don’t refill ink during the petal drawing. One supply for one set of the flower. You can get good gradation in the one set of the flower. You don’t need to be careful about stem and leaves. November 1st is the day of the dog in Japan. There is some twists trick.. I am going to unbundle it. November 1st is depicted by the numbers of three in a row "1". so we got three one. The dog barks ‘wan, wan, wan’ in Japan. What about your place?? Then, now you got it. The combination with English pronounciation of 1 to dog barking in Japanese have mixed and someone sets the dog of the day on Nov. 1. I didn’t know it was the day, though. YouTube featured some of dog related video in associated with the dog day including my vid. ‘Komi’ is used for emphasis. So, What I drop emphasisly, or so much is water. ‘Tarashi-komi’ technique use the water a lot. Fisrt, you put only water directly on the paper. Then, put sumi-ink on the water teritory. The sumi-ink will diffuse until the boader line of the water penetration area. In tarashi-komi technique, you need to controll the uncontrollable water movement. The water spreads out in slow. So, drop the water then take a breathing, relaxing. It goes forward step by step in watching the water drop pervasive. Now you might know you have to watch out the volume of sumi-ink drop. Yes. 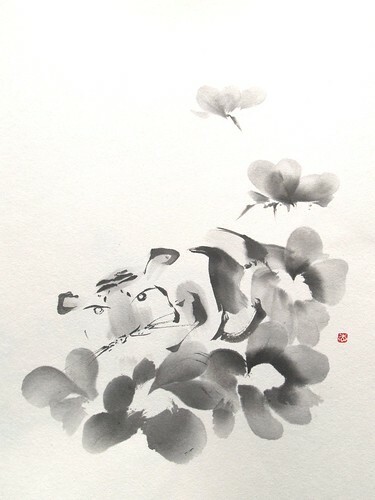 It would be better that the first sumi-ink drop make it a small portion and observe the spread speed of it. I guess I put too much attention note. The joy of the tarashikomi is on the unpredictable sumi-ink spread. 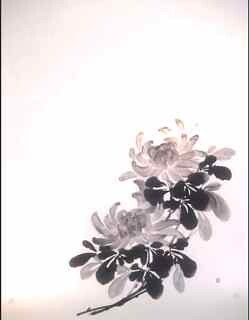 The exuding of sumi-ink enable to depict the fluffy hair of dog, like toy poodle. 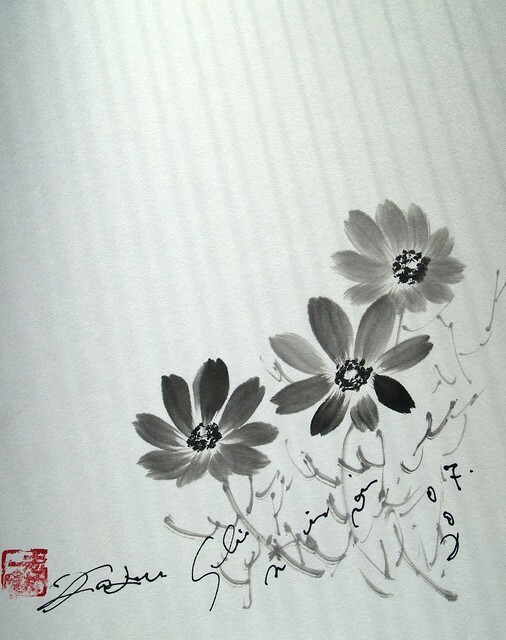 Overglaze sumi-ink with the water can express uncountable things. It is no necessarry to draw the accurate line in order to get what is real. The tarashikomi technique gives you the cuteness of what you saw. It is 2 dimentional manga way of thinking. 2D can express much more than 3D can sometime. so, please enjoy the tarashi-komi. ■　Draw the shape with the water only brush. Drawing line will dissapear when dried. The line will become the dizzy Long Wall when the tarashikomi sumi-ink spread. Sumi-ink invasion is supposed to stop on the line. ■　Put only water in the brush, then paint the water on the far away point from the line. That avoids the water going beyond the line. ■　Please remember the area wet becomes the drawing shape in the tarashikomi technique. The sumi-ink won’t go beyond where the water carried it away. ■　Now you got the water job done. Then we are in the sumi-ink process. ■　Please don’t drop or paint the sumi-ink near the water boader. Sumi-ink spread power is huge. It is more than you think. So, you need to handle the sumi-ink process with care. Otherwise, your sumi-e will grow like balloon. 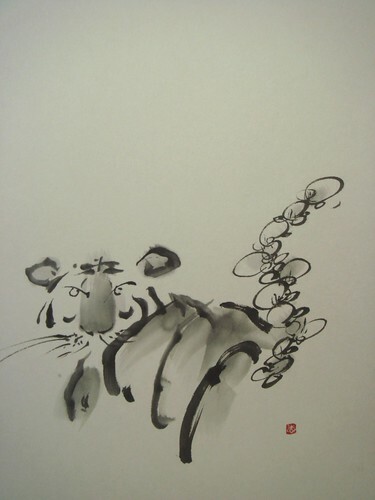 ■　Put sumi-ink and take a breath until it stops diffusing. The next sumi-ink drop will be done, then. Need patience. Be calm. ■　The edge of exuding sumi-ink might be the good expression of fluffy hair. You can levarage it. kings that kept entertaining me during summer holiday. not buzz. it is summer symphony or rain shower in woods. Sorbed into rocks’ <- make sense? Body: Use the brush body so that you can get vague gradation naturally. It gives the cicada body color. Eyes: The eyes of cicada is located on the edge of the body (or face). Make it the most black sumi ink. Wings: Each cicada has different color wing. Some has dark brown one and some has trasparent one. I like to depict very soft thin wing here. Put very light sumi ink on the brush and draw softly. I was believing Bodhidharma was Japanese. Because I played a game called "dharma-san" a lot. This is said "tag" in my dictionary. (as always no idea for the right words) anyway, everybody knows a tag called dharma-san ga koronda. and lots of designed dharma figure coloured red are here. even I loved to have a "dharma box lunch" at Takasaki station which was on the way to the country house. It futures the dhrma face(see the link). So my image of dharma is from this box lunch and thought evry kind person like a priest in the cinema. 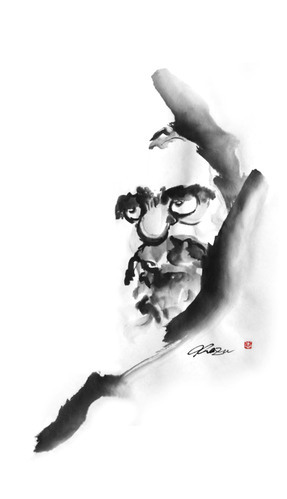 The real bodhidharma was not like today’s deformed one. He was very stubborn and severe. He was from India, so he got large eyes and long nose. 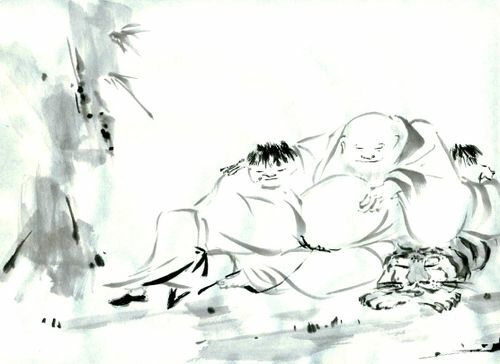 I was surprised at Hakuin or Sesshu bodhidharma paintings because they have very severe dharma san. 1. Front neckband is the key to draw the tradional asian figure wearing kimono style clothes. I made the hard line first which was inspired by the Hakuin’s line and Sesshu’s cave rock line. 2. First, light black (more water than usual) is on the eyebrow, then before getting dry fully, put more black stroke added. So you can get some depth, profound expression.